Botox is quick procedure chosen by millions of Americans to eliminate wrinkles. 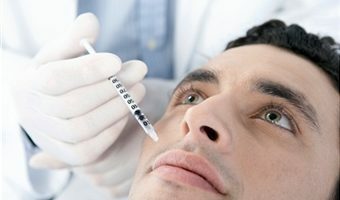 It has been labeled a lunchtime procedure because it only takes 15 minutes to complete, so patients can book an appointment and treat wrinkles with Botox during their lunch hour. This has made it an attractive option for men and women in Irvine, and other parts of Orange County. Botox is derived from the protein botulinum Toxin A. Botox is FDA approved for the treatment of wrinkles on the face. It is used to smooth frown lines between the eyebrows, horizontal forehead lines, as well as lines at the corner of the eyes (crow’s feet). Botox is injected into the muscles under the skin, where it works to block the release of neurotransmitters. This in turn inhibits the transmission of nerve impulses to the muscles, and this prevents the muscles from contracting. As the muscles relax, no new wrinkles will emerge, and existing ones become less distinct. When the treated muscles become relaxed enough then the results become clear. This normally takes about 5 to 7 days. There are no long term side effects related to Botox. Patients generally have some minor bruising that fades within a few hours. Although there is really no downtime with botox injections, doctors do recommend that patients take at least 24 hours to recover after the procedure. Botox is a temporary fix that only lasts for about 3 to 4 months, so if you want to treat wrinkles and maintain consistent results, then you have to go in for Botox touch-ups at least 3 times a year. If you reside in Irvine, then you can contact Dr. Kyle Song at Song Plastic Surgery (click here) for consultation about Botox injections.